The governance community often waits on public policy demands before taking considerable steps towards the so-called trending topics related to social, environmental and governance (ESG) issues. However, despite the implementation of the 2014/95/EU directive of the European Parliament and EU Council regarding disclosure of non-financial and diversity information, the Spanish government seems to be not only late but extremely simplistic and, well, simply lacking. On 24 November, the government enacted the Royal Decree-Law 18/2017 regarding non-financial information and diversity issues. Measuring and implementing performance metrics is not only about citizenship; companies in Spain are considerably mindful that these may influence the confidence of institutional investors and contribute to the avoidance of reputational risks. The statement must include a description of any policy’s results and the risks linked to these issues must be incorporated in the management report. As an alternative, companies may issue a separate report that meets the same requirements established by law for the management report. The key aspect of this initiative is that the board of directors will be responsible for oversighting the integrity of the information disclosed. The Royal Decree establishes that the disclosure should be based on national or international benchmarks and companies will have to justify why they chose one methodology over others. Finally, external auditors will be in charge of verifying that the non-financial information disclosed is complying with the requirements, otherwise it will be mandatory for the firm to state that such information is not available. Granted it’s a huge step to compromise boardrooms on the ESG information submitted to the public. However, it is easy to predict that most companies will include the information in the management report, as a ‘bundle proposal’ and it will be difficult to measure the real level of support from investors on the quality of the information. Most companies that haven’t adopted specific policies on ESG matters choose to include statements of commitments on environment, human rights and social issues in the corporate social responsibility (CSR) policy or CSR management integrated system. Analysing publicly available information we reviewed 33 companies. General benchmarks to disclose non-financial information, are the IIRC Conceptual Framework, the Global Reporting Initiative Sustainability Reporting Guidelines (GRI G4) and we observed frequent references to the Principles of the United Nations Global Compact (UNGC), Guiding Principles on Business and Human Rights (Ruggie Framework), Sustainable Development Goals (SDG), International Labour Organisation’s (ILO) Fundamental Conventions and OECD Guidelines for Multinational Enterprises (OECD). The Institute for Social and Ethical Accountability AA1000 standard is mentioned in the reports of 12 companies of the Ibex 35. Commitments to climate change, LGTB community rights, non-discrimination policies and the need to innovation to promote a wider range of opportunities for employment seem to be a priority and common ground that, if applied effectively, will hopefully convey great benefits to Spain, where tolerance and innovation are key components to preserve the cornerstone of European principles and foundations. Twenty-five of the companies in the Ibex 35 stated a clear commitment against any kind of discrimination, including gender, race, religion or sexual orientation. Some stats on how ibex 35 companies approach non-financial disclosure can be seen in Tables A, B and C below. 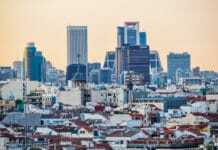 Proxy season in Spain has not left any significant surprises during 2018. Overall, the same issues that have generated greater scrutiny by foreign institutional investors during the previous seasons persist, in part due to the lack of substantial changes in the regulatory framework. The season was marked by corporate operations, such as the take-over bid for Abertis by the Italian group Atlantis and its competing offer issued by the Spanish ACS group (through Hochtief). The takeover bid for Abertis also affected other listed companies in which it had a relevant stake, such as Cellnex with around 34 per cent and Hispasat with more than 89 per cent of the issued share capital. In the end, Atlantis and ACS presented a joint offer, which has led Abertis to exit the Ibex 35 index and will lead it to stop trading in the markets in 2019. One fun fact of this season is that Gas Natural became Naturgy and the new name was announced to the market during the annual shareholders meeting. The political environment had a considerable influence on the structure of the governing bodies for some listed companies. On 1 June 2018, a no-confidence motion against the then president of the government, Mariano Rajoy of the Popular Party (PP), went through and the head of the opposition party, Pedro Sanchez of the Spanish Workers Party (PSOE), was appointed as new head of the government. 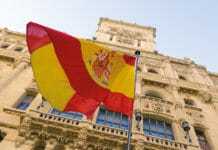 The Spanish state owns a relevant stock, generally through the SEPI (State-owned Industrial Participation Company), a vehicle for holding shares. The most representative companies are Indra with 18.7 per cent, Red Eléctrica Corporación with 20 per cent, Enagas with five per cent and AENA with 51 per cent (through Enaire). As always happens, a change of government precipitated changes to the boards of most of these companies. In AENA, two female proprietary directors resigned and were replaced by a man and a woman. The CEO and chairman Jaime García-Legaz Ponce also submitted his resignation, while Maurici Lucena Betriu was appointed in the same capacity on 16 July 2018. As for Red Eléctrica Corporación, on 31 July 2018, the board of directors accepted the resignation of the chairman D. José Folgado Blanco and appointed Jordi Sevilla Segura in the same capacity without executive functions, keeping Juan Lasala as CEO. A contentious issue to highlight is Iberdrola shareholder’s proposal at Siemens Gamesa Renewable Energy shareholders’ meeting, held on March of this year. Iberdrola submitted the following items to be included in the agenda: (i) strengthening of the corporate governance of the company in the area of related-party transactions for the protection of minority shareholders considering the risk of de facto management by the majority shareholder; and (ii) commitments made in connection with the maintenance in Spain of the registered office, the principal place of business and the operational headquarters as parent company of the group, as well as the principal place of business and operational headquarters of the onshore business: measures to ensure compliance therewith. The shareholders’ meeting was held on the first call with a quorum of 81.40 per cent. Although the proposals did not prosper, the first item relating to strengthening the corporate governance of the company obtained 22.95 per cent support, while the second item included in the agenda obtained 12 per cent of support. The level of attendance during this proxy season has been reasonably high, which may be due to a reasonable level of concentration of ownership on some companies. It is important to clarify that the present analysis is carried out with the components of the ibex 35 valid during the season, including Abertis which was replaced later on by CIE Automotive. 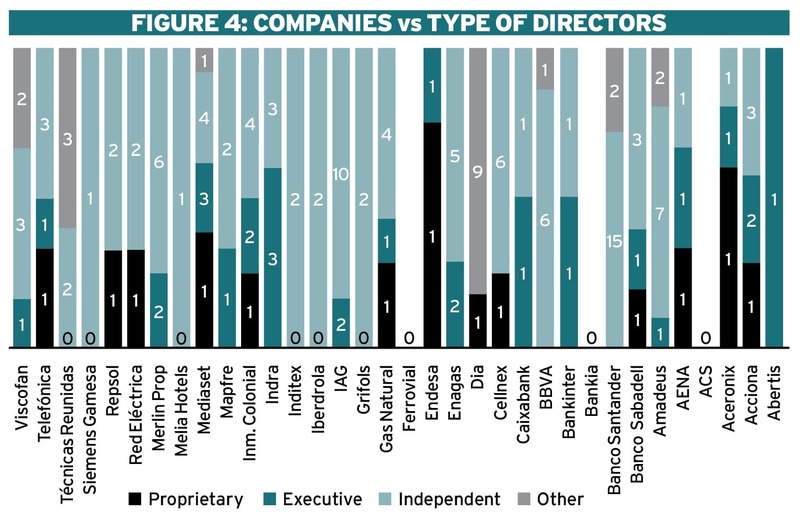 Arcellor has also been excluded since the bulk of issues related to corporate governance are concentrated outside of Spain. The average attendance quorum during 2018 was 71.02 per cent. Compared with 2017 (66.22 per cent) and 2016 (65.85 per cent), we see that there has been a significant increase. Companies with highest level of participation in 2018 were Inditex (88.24 per cent); Gas Natural (83.82 per cent); Cellnex (83.55 per cent); Acciona (82.89 per cent) and Mapfre (82.07 per cent) (see Figure 1, below). 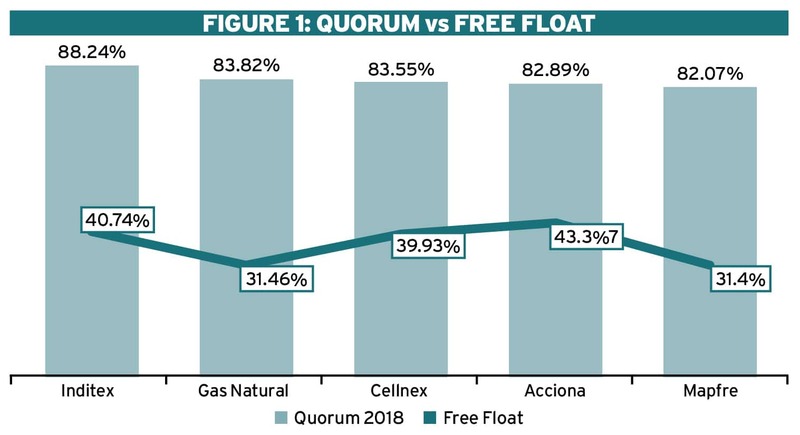 It’s interesting to see the level of attendance of companies with the highest free float, such as BBVA, Banco Santander, Banco Sabadell, Enagás and ACS. With the exception of the latter, they have a significant foreign capital penetration that is reflected in their commitment to corporate governance standards and initiatives to engage shareholders (see Figure 2, below). 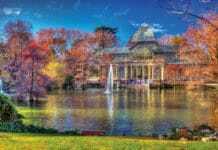 Unlike other hemispheres, the months with the highest concentration of shareholders’ meetings in Spain were March and April with nine meetings each month, followed by May in which eight meetings were held, then June with seven venues and July with one. The majority of the meetings (17) were held in Madrid, followed by Alcobendas (3), Valencia (2) and Bilbao (2). 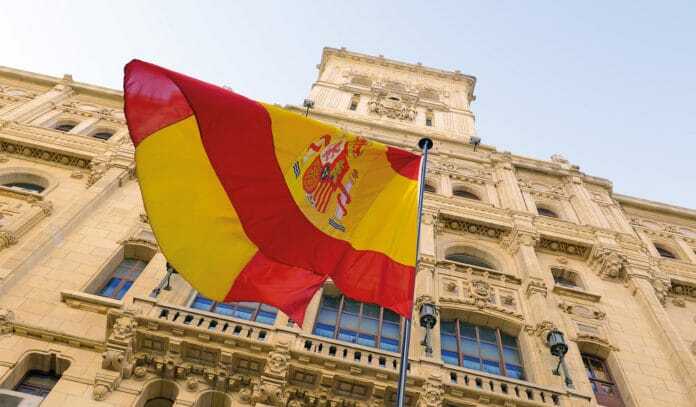 During the proxy season, 22 companies submitted for the approval of the shareholders the remuneration policy, which under Spanish legislation requires a binding vote and a renewal every three years; 16 companies offered incentives plans linked to shares. Within the financial sector five entities requested authorisation for the award and pay out of the variable remuneration for identified staff under the premise of the CRD IV of the European Central Bank. Both Bankia and BBVA were the exception to requesting authorisation for the approval of share incentives plans. 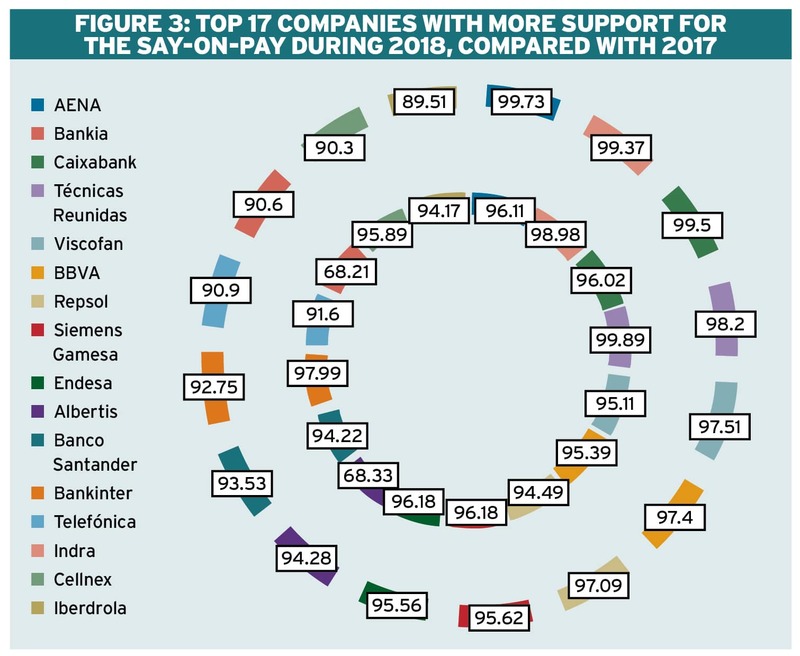 Figure 3 (below) shows the top 17 companies with more support for the say-on-pay during 2018, compared with 2017. One hundred and sixty-six directors were appointed or re-elected during this season by the shareholders. The largest number of directors to be submitted for approval were the independent external directors (99), executive directors (28), proprietary directors (27) and other external directors (20). Eleven listed companies submitted for approval the exact number of board seats. Figure 4 (below) shows which the viewer may see which category to directors were submitted of the meeting by company. Fourteen of the ibex 35 companies submitted the external auditor for re-election during the proxy season, while only one of them (Amadeus), submitted a proposal for the appointment of a new firm to the general shareholders’ meeting. The average number of consecutive years that the Ibex35 audit firms are with listed companies today is almost eight years. Meanwhile the average of non-audit fees is 24.17 per cent compared to the total perceived by the firm during the fiscal year. The listed companies that have more consecutive years with the same audit firm are Banco Sabadell (35), Grifols (28), Day (27) and ACS (27). 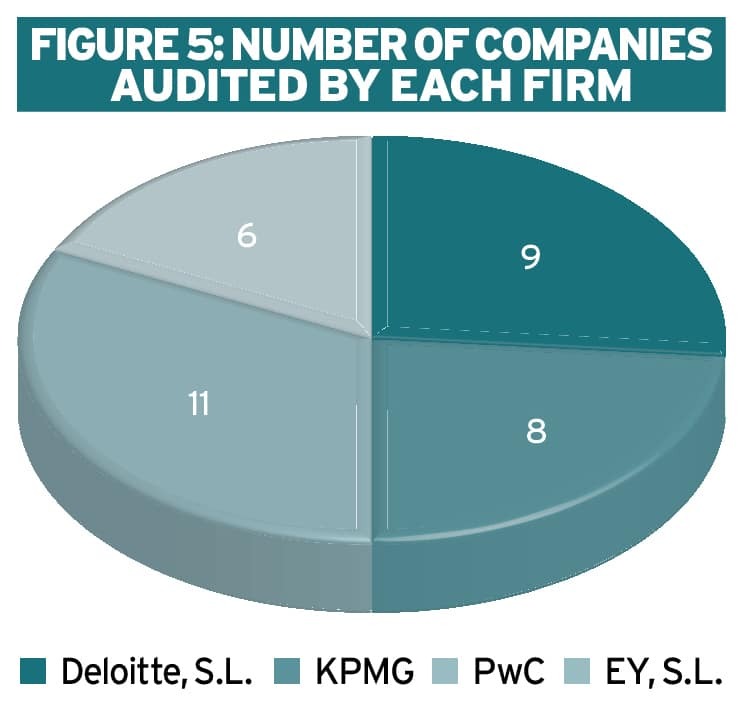 Currently, the firm that has the largest number of concentrates within the ibex 35 is PwC, which audits 11 listed companies (see Figure 5, right). Eight companies requested authorisation to delegate to the board of directors the possibility of issuing convertible bonds. Fifteen companies requested authorisation to acquire shares, while only two requested authorisation to issue bonds. This is because of the reform incorporated in the law for the promotion of business financing that allowed companies to transfer to the boards of directors the ability to authorise the issuance of debt without previous approval of the shareholders’ meeting. Ten companies requested authorisation to delegate to the board of directors the issuance of share capital, with the possibility of excluding pre-emptive rights. Eighty per cent of the companies requested authorisation for five years to increase up to 50 per cent of the capital, limiting the right to exclusion up to 20 per cent. However, some companies limited the authorisation to three years. Thirteen companies requested the amendment of the bylaws and five submitted for approval by the shareholders the modification of the regulations of the shareholders’ meeting. Eleven companies reported on the modification of the regulations of the board of directors (see Figure 6, below). Paola Gutiérrez Velandía is considered an authoritative voice on Spain’s corporate governance system and also provides invaluable help by promoting dialogue between investors and the board. 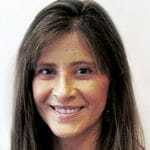 Paola is the editor of the Corporate Governance Voice Group, and she is also a member of the Business Commitment Advisory Council. 1.Due to problems in accessing the website Mapfre was not analysed and neither was Arcellor Mittal as it´s mainly listed abroad.